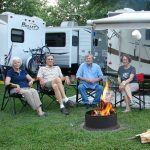 103 landscaped camp sites for tents or large RVs. Wireless internet, game room, laundry, camp store, playgrounds, swimming pool, bike and golf cart rentals. A trolley bus takes campers to local points of interest for a small fee. 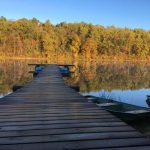 An outdoor lover’s paradise, the Cove is 3,000 mountain acres with boating, fishing, hiking, a sandy beach with swimming, ATV trails, a target range, 100 campsites, and cabins.